I have the easiest recipe for all of you! All you need is a jar of your favorite salsa (any will do) and some frozen chicken breasts. 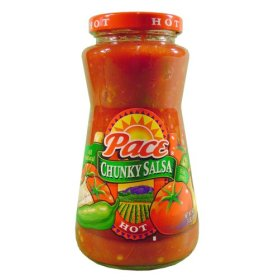 I like to use Pace chunky salsa, HOT for this recipe. Really any will do. Put 4-6 frozen chicken breasts in your crock pot. Pour salsa (use entire jar) over the chicken. Cook on LOW for 6-8 hours, or HIGH for 3-6 hours. When the chicken is done it should be easy to shred. Shred and serve with tacos. We love to use this recipe to make tacos with. It's really good with some sour cream, cheese, and lettuce in a taco. You could also do taco salad with it as well. Let me know if you try it out, and what you think of it!